Most of us amass disparate pieces of information we need to keep around, be they receipts for online purchases, scans of important documents, or just notes we’ve typed. Together 3 aims to keep all those bits of information in one easy to organize place. Building upon the already excellent Together 2, the new revision adds some compelling capabilities. Together presents your information in three columns. On the left you’ll find a list of sources, various groupings of the items you’ve created or placed in Together. Some of the sources are automatically populated—the Images source, for example, contains every image file in your Together library. You can create custom groups that, like iTunes playlists or iPhoto albums, hold whatever items you drag into them. Together also offers “smart” groups that are automatically populated based on user specified search terms. Clicking a toggle at the top of the column presents a list of the tags that have been applied in the current library. 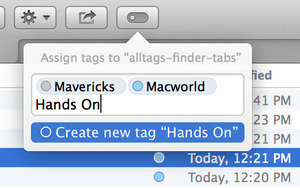 Avid taggers will want to take advantage of custom Tag Bundles, which are basically folders for grouping similar tags. Click any of your left-column sources and Together lists its constituent items in the center column. Each line shows the item’s name, type, size, creation date, and preview if available (icon if not). Click on the list item and it loads in the rightmost column. Plain and rich text items can be edited directly inside Together. Other types will display a preview when possible and an icon when all else fails. Double click a list item to open it in its native application. Together 3 excels at pulling all those random bits and pieces of information, well, together. Together 3 executes its core duties with the same aplomb as the lauded Together 2. But this version packs several new features that enhance the experience. The general design has been refined in subtle ways including tabbed viewing for those editable text items and a popup item information pane that can be invoked by simply pressing the space bar. The new Stationery feature allows you to take any item of any type and designate it as stationery. When an item is selected from the Stationery popup list Together creates a fresh copy and places it in your library. What I find compelling about Together’s approach is that anything can be stationery. I have several FileMaker Pro databases that I frequently copy and customize for different needs. Dropping them into Together as stationery allows me to spin off versions as needed with the assurance that I’ll always have a pristine copy when I need one. Together 3 adds iCloud storage and syncing. 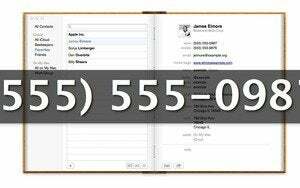 Create an iCloud-based library and all your Macs can share it. For those who stay within Apple’s walled garden this can be useful, but it’s not without fine print. It’s only available to those who purchase Together through Apple’s Mac App Store. Obtain the product any other way, including the developer’s own website, and you’re out of luck. Also, existing Together libraries can’t be moved to iCloud automatically; one must create an empty iCloud library and import the contents of any pre-existing libraries. With no Web or smart phone apps, Together’s cloud play can’t approach the offerings of rivals like Evernote with its Mac OS, iOS, Windows, and Android clients. And as with all cloud-based storage services, you’re not in control of your data. While corruption, loss and theft of your data are unlikely, you don’t get a say in how it’s handled. In a bid to siphon off customers from competing products, Reinvented Software offers import tools (in a separate download) designed to pull in data from Bare Bones Software’s Yojimbo ( ) and the increasingly common Evernote ( ). I tested both with a 400-item library and Together imported the data tolerably well. Despite following the instructions to avoid it, I still ended up having to enter my Yojimbo password for each and every encrypted item I imported. Once in Together, all the items were present in the same groupings and tags intact. The Evernote importing tool was dramatically slower than the Yojimbo importer, taking ten minutes to achieve what the former could do in one. Even so, the items came through correctly and it’s a whole lot better than retyping. Together 3 builds on the success of previous versions and remains one of the best executed note and file organizers out there. It’s not for those who need to collaborate with other people on a variety of computing platforms, but it’ll serve everybody else quite well. 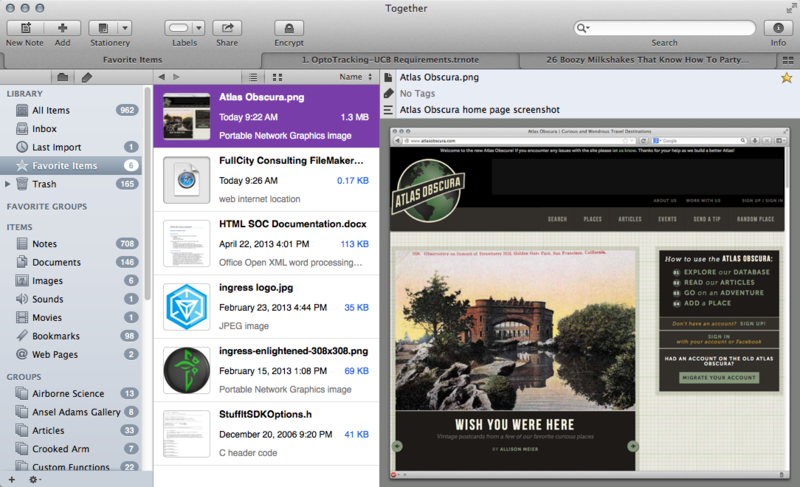 Together remains one of the best executed note and file organizers out there. Broad but not overwhelming feature set.